Russia made its first launch of 2018 Thursday, using a Soyuz-2-1a/Fregat-M rocket to deliver a pair of Kanopus-V satellites to orbit. Soyuz lifted off from the Vostochny Cosmodrome in Eastern Russia at 11:07 Yakutsk Time (02:07 UTC), beginning a five-and-a-half-hour mission that will also include the deployment of nine secondary payloads. The two Kanopus-V satellites are part of a series of civilian Earth imaging satellites being deployed by Russia. Also known as Kanopus-Vulkan, the constellation will provide wide-angle images to compliment the higher-resolution Resurs satellites. The spacecraft aboard Thursday’s launch are Kanopus-V No.3 and Kanopus-V No.4, the third and fourth satellites in the constellation. Kanopus satellites are operated by the Russian Federal Space Agency – Roskosmos – in conjunction with the Federal Service for Hydrometeorology and Environmental Monitoring, or Roshydromet. 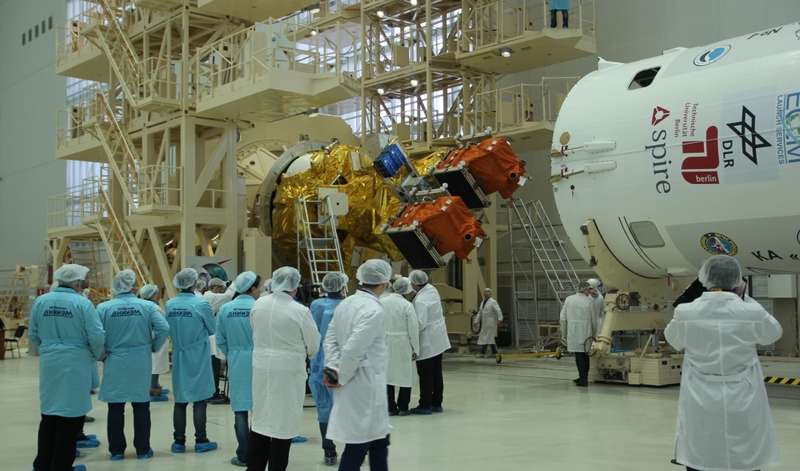 In addition to the Kanopus-V imaging satellites an oceanography mission, Kanopus-ST, was launched in 2015 but failed to separate from the upper stage of its Soyuz-2-1v/Volga carrier rocket. Both satellites carry the same three optical imaging payloads. The Panchromatic Imaging System, or PSS, offers a resolution of 2.5 meters (8.2 feet). It operates at wavelengths between 0.52 and 0.82 microns. The Multispectral Imaging System (MSS) has a resolution of 12 meters (39 feet), operating in four spectral bands at wavelengths of 0.54-0.60 microns, 0.63-0.69 microns, 0.69-0.72 microns and 0.75-0.86 microns. Both of these sensors have an imaging swath width of 20 kilometers (12 miles, 11 nautical miles). The third instrument, Multispectral Scanner Unit 200 (MSU-200), provides multispectral imagery at wavelengths between 0.54 and 0.86 microns. It images at a resolution of 25 meters (82 feet), with a swath width of 250 kilometers (155 miles, 135 nautical miles). Thursday’s launch was the first time two Kanopus satellites have launched together, although the first satellite – Kanopus-V No.1 – launched alongside BKA, a copy of the Kanopus design that had been produced for Belarus. The launch took place in July 2012, using a Soyuz-FG/Fregat rocket. Kanopus-V No.2 was renamed Kanopus-V-IK and launched last July. It carries an additional infrared imaging payload that is not present on other Kanopus-V satellites. Nine smaller satellites are sharing the journey into orbit with the Kanopus satellites. These consist of four S-Net nanosatellites for the Technical University of Berlin, four Lemur-2 CubeSats for US firm Spire Global, and German Orbital Systems’ D-Star ONE Phoenix CubeSat. The rocket is also carrying several mass simulators for payloads that were originally to have been flown but which were removed from the launch. The S-Net satellites will be used to conduct communications experiments in orbit. Each satellite carries an SLink transceiver – an S-band communications payload providing bandwidth of 100 kbps for crosslinks between the satellites, and a 1,000-kbps downlink to ground stations. The spacecraft also carries retroreflectors to allow their orbits to be measured precisely from the ground and a small imaging payload. Each of the S-Net spacecraft has a mass of 8.5 kilograms (18.7 pounds) and is cubical in shape, with sides of 240 millimeters (9.45 in). Magnetorquers provide each satellite with three-axis stabilization. Once on orbit, the four S-Net satellites will be used to test the SLink system, testing out different network topologies – or layouts – for inter-spacecraft communications. By using four spacecraft, different configurations can be tested, including making multiple hops between the satellites. The mission is expected to last one year, and it is hoped that it will demonstrate techniques that could lead to distributed networks of satellites operating autonomously in the future. 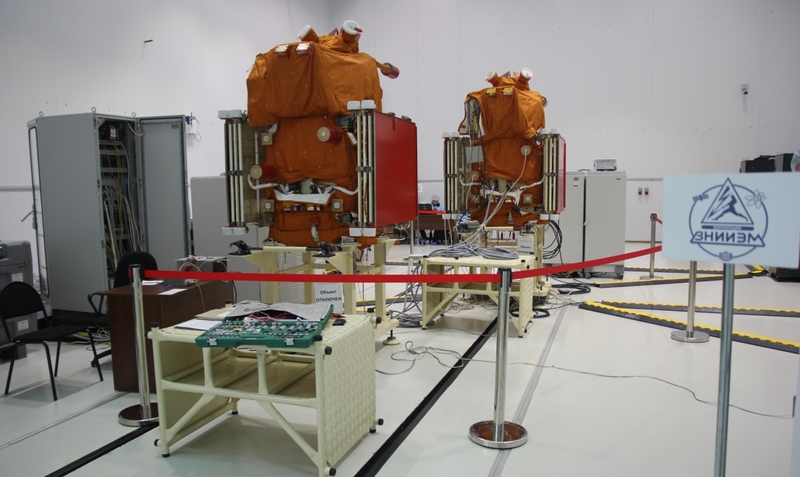 The four Lemur-2 satellites will join Spire’s ever-growing constellation of satellites. They are the seventy-fourth to seventy-seventh Lemur-2 satellites to be launched. Each satellite is a three-unit CubeSat, carrying two payloads each. The STRATOS instrument measures how signals from GPS satellites are affected by passing through the atmosphere, which allows atmospheric conditions such as temperature, pressure and humidity to be determined. SENSE serves to collect automated identification system (AIS) signals from ships at sea, and relay these back to the shore. Thursday’s is the third launch of the year to carry Lemur satellites – four were aboard India’s PSLV launch last month, with two more aboard Rocket Lab’s Electron for its “Still Testing” mission. D-Star ONE Phoenix is an amateur radio satellite built to the three-unit CubeSat standard and equipped with four radio modules. Two of these will be reserved for telemetry and operational data, while the other two will be made available to amateur radio operators. The satellite replaces D-Star ONE, which was lost in a launch failure late last year. Phoenix – named for the mythical bird, rising from the ashes – was put together from spare parts in less than 44 days. The original D-Star ONE satellite, along with ten Lemur-2 satellites and seven other spacecraft were secondary payloads on the unsuccessful launch of Russia’s Meteor-M No.2-1 weather satellite last November. The Meteor-M launch used a Soyuz-2-1b rocket with a Fregat-M upper stage – it was the first time a Fregat had been used on a launch out of Vostochny. The Soyuz rocket performed as expected, however the Fregat ignited for its first burn in the wrong orientation, hastening its fall back to Earth instead of inserting itself into orbit as had been planned. 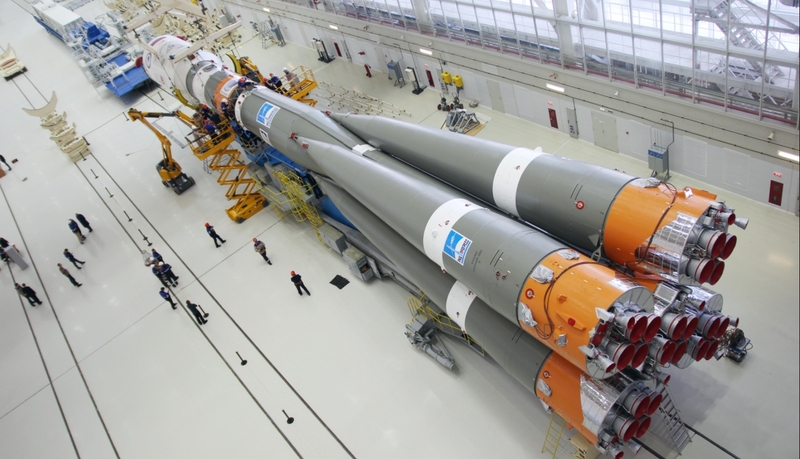 In late December Russia’s Deputy Prime Minister, Dmitry Rogozin, announced that the failure had been caused by a programming error and that Fregat had been loaded with a flight profile for a launch from the Baikonur Cosmodrome instead of Vostochny. This followed earlier reports that the problem was caused by an offset between the Soyuz and Fregat guidance systems that, when combined with the launch azimuth out of Vostochny, led to the stage’s guidance system realigning incorrectly and commanding an unnecessary corrective maneuver that was still in progress when the stage ignited. Thursday’s launch was the first flight of Soyuz with a Fregat upper stage since the failure – although both Soyuz and Fregat returned to flight separately last year: Soyuz with two launches that did not require an upper stage, and Fregat through the launch of a Zenit-3F rocket at the end of December. The Kanopus-V mission was the third launch from the Vostochny Cosmodrome, which opened in April 2016 with the successful launch of the MVL-300 satellite aboard a Soyuz-2-1a/Volga rocket. Vostochny – meaning Eastern – is located in Russia’s far Eastern Amur Oblast region. 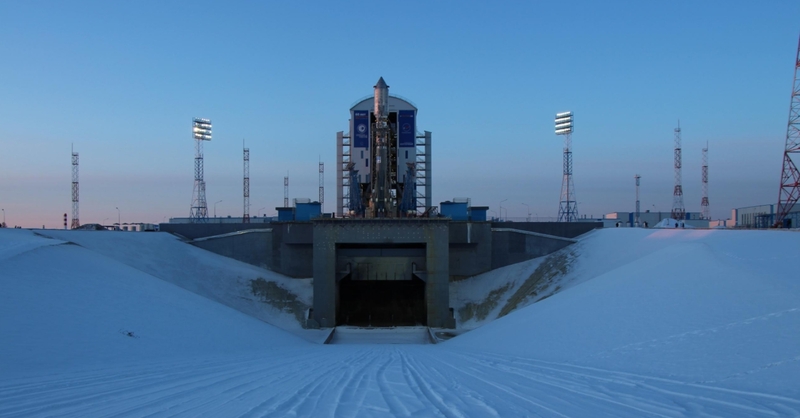 The site is intended to be a long-term replacement for the Baikonur Cosmodrome, which Russia has leased from Kazakhstan since the end of the Soviet Union. The launch site is built on the site of the old Svobodny missile base, which also supported a small number of orbital launches made by Start-1 rockets between 1997 and 2006. Vostochny’s Soyuz launch pad is designated Site 1S. Soyuz is derived from Sergei Korolev’s R-7, which became the world’s first intercontinental ballistic missile (ICBM) when it made its maiden flight in 1957. A modified R-7 was used to deploy the world’s first satellite, Sputnik 1, later the same year, and the R-7 would also form the basis of the Vostok rocket that carried Yuri Gagarin into orbit in 1961 – as well as the later Voskhod rocket. The original Soyuz rocket, designated 11A511, first flew in 1966 as an improved version of the Voskhod intended to launch manned missions with the Soyuz spacecraft that was then in development. A further improvement, Soyuz-U, first flew in the mid-1970s and remained in service until last year. The Soyuz-2 – which made its debut in 2004 – modernizes the rocket, incorporating digital flight control systems and improved engines. Three different versions of the Soyuz-2 have been developed. The Soyuz-2-1a, which was used for Thursday’s launch, is simply a modernized version of the previous Soyuz design. The more capable Soyuz-2-1b has a modified third stage with a new RD-0124 engine. The Soyuz-2-1v is designed to carry smaller payloads. Based on the Soyuz-2-1b, it flies without the four boosters that normally make up Soyuz’ first stage and has an NK-33 engine powering its first stage – Soyuz-2-1b’s second stage. All three stages of the Soyuz vehicle burn RG-1 propellant – rocket-grade kerosene – with liquid oxygen as an oxidizer. The Fregat upper stage uses hypergolic propellant: unsymmetrical dimethylhydrazine oxidized by dinitrogen tetroxide. About sixteen seconds before liftoff, Soyuz ignited its first and second stages. The first stage consisted of four liquid-fuelled boosters powered by RD-107A engines, while the second stage has a single RD-108A. Burning together, these engines powered Soyuz for the first 118 seconds of Thursday’s mission before the first stage separated. As the boosters fell away from the core vehicle they made a pattern known as the Korolev Cross, after the rocket’s Chief Designer. About three minutes and 43 seconds after liftoff, the payload fairing separated from the nose of the rocket. The fairing, which protects the payloads as the rocket ascends through the atmosphere, was no longer needed once it reached space and was discarded to save weight. Two minutes and 49 seconds after first stage separation, the rocket’s third stage ignited, and the second stage was discarded. Soyuz employs a “fire in the hole” approach to stage separation, with the third stage igniting its RD-0110 engine while the second stage is still burning. The third stage burn lasted just over four minutes, separating from Fregat at eight minutes and 49 seconds mission elapsed time. Five seconds after it separated from Soyuz, Fregat ignited for the first of its seven planned burns. This 55-second firing of its S5.92 engine injected Fregat and its payload into an initial parking orbit. The stage restarted after a 46-minute, three-second coast phase, making a seventy-five second burn to reach the initial deployment orbit for the Kanopus-V satellites. The first satellite separated about 100 second after the end of the burn – 58 minutes and 57 seconds after liftoff – with the second separating five minutes and 50 seconds later. 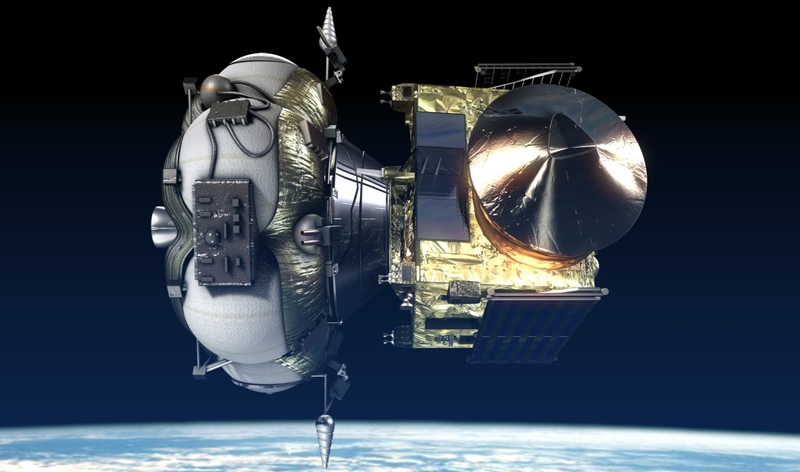 After separation of its primary payload, Fregat made two further burns – the first to raise its orbit’s apogee to about 650 kilometers (404 miles, 351 nautical miles) and the second to raise its perigee and circularise the orbit at this altitude. The third burn began 31 minutes and 53 seconds after deployment of the second Kanopus satellite and lasted for 67 seconds. The fourth burn, lasting 66 seconds, was made following a 41-minute, 23-second coast. Five minutes and 28 seconds after Fregat completed its fourth burn, the four S-Net satellites were deployed. This process took about thirty seconds. The remaining payloads were released during a 13-minute, 20-second period beginning three minutes and 40 seconds after the final S-Net satellite’s separation. This was scheduled to have concluded by two hours, 43 minutes and 14 seconds mission elapsed time. With all of its payloads separated, Fregat was tasked with two further burns to adjust its orbit, at three hours, ten minutes and 50 seconds and four hours, two minutes and 30 seconds into the flight. Four hours, fifty-one minutes and 40 seconds after liftoff Fregat will fire its engine for a seventh and final time, performing a 108-second deorbit burn. The stage will be destroyed during reentry into Earth’s atmosphere over the Pacific Ocean, southwest of Mexico, following what is planned to be a five-hour, 27-minute and 26-second flight. 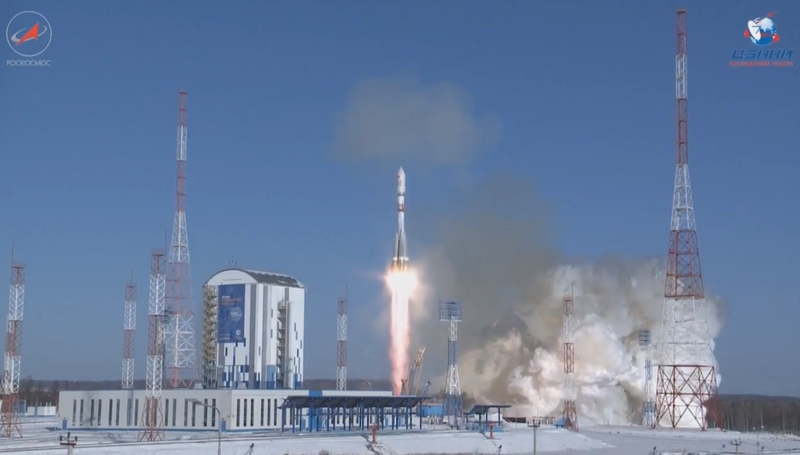 Thursday’s launch was Russia’s first of 2018. The country’s next orbital launch, which will also use a Soyuz-2-1a rocket but without the Fregat upper stage, is planned for 11 February with the Progress MS-08 resupply ship bound for the International Space Station. Another Kanopus-V launch is planned later this year, adding two more satellites to the constellation.